Estimates vary on the length of time recruiters and hiring managers spend reading resumes. Some experts estimate a frightening six seconds but most estimate the average is about 30 seconds. In either case, you have very little time to make your case, prove you possess the qualifications for the position applied for and leave the recruiter “wanting more” – to be gained in the coveted interview. Other studies actually track the eye movement and brain activity of these recruiters as they peruse the resume (or Linked In profile ). 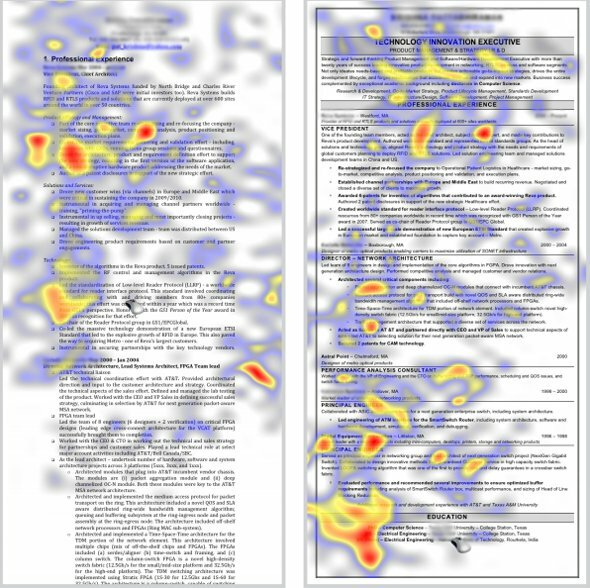 In the examples below, note that the red areas correspond to more brain activity and in the left hand example, there is red at the top third section, but it disappears thereafter – so does the interest of the recruiter as s/he moves your resume to the “No” pile. The resume on the right, however, receives more attention, more time and more consideration by the recruiter – success! After the recruiter takes the initial “snapshot” of the name, current and previous work history, company names and education, they move quickly to look for keywords which match up to the job posting. This takes far less than a minute for an experienced recruiter and that is why it is crucial to make a quick positive impression through a well crafted resume. How to do you make your points in less than 30 seconds? To ensure no errors or misspelled words, use your computer’s technology but also read and re-read your resume multiple times, even from the bottom up in order to detect errors in spelling or punctuation. Share the finished product with a trusted friend for his or her input. Is the resume readable and does it makes sense? Lastly, it may be a wise investment to have your resume professionally written. Your resume and Linked In Profile are your marketing tools. If well done, you will succeed in getting interviews more quickly as well as the job offer. Speaking to the metrics – so important it quantifies what you say you did in the past and sets you up to share SOAR stories in the interview. So many people I help with their resume put a laundry list of the duties vs the result and the laundry list is old school!